It would be nice to have more than one object in your HTML5 game. Multiple objects make the game a bit more exciting and adds some depth. One object bumping around by itself isn’t much fun. What good are bugs if you can’t be infested with them? 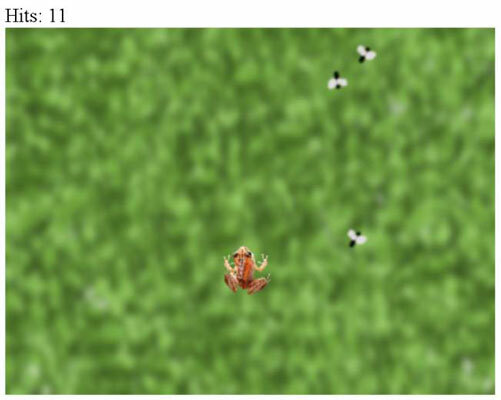 Because the game was created with object-oriented principles, it’s quite easy to add multiple flies. Here’s the code. Change the fly variable so it’s now called flies. Rather than a single fly variable, you’ll be working with an array of flies. Store the number of flies in a special variable called NUMFLIES. This tracks the number of flies in the game. You can easily change this value to make the game harder or easier. Note that the value of NUMFLIES isn’t expected to change during a single run of the game, so you put it all in uppercase to indicate it’s a constant. Add a hits variable and a scoreboard div. This variable will keep track of the number of fly-frog collisions. There’s a corresponding div, which will display the score.